Greenberfield Middle Lock No 43 is a minor waterways place minor waterways place place on the waterways major waterways place village town city on the Leeds and Liverpool Canal (Main Line - Wigan to Leeds) between Salterforth Bridge No 151 (Salterforth Village 200 yards northeast) (2 miles and 3½ furlongs and 1 lock to the south) and Skipton Junction (Junction of Springs Branch with Leeds and Liverpool Canal Main Line) (11 miles and 6¼ furlongs and 13 locks to the east). It is part of Greenberfield Locks. 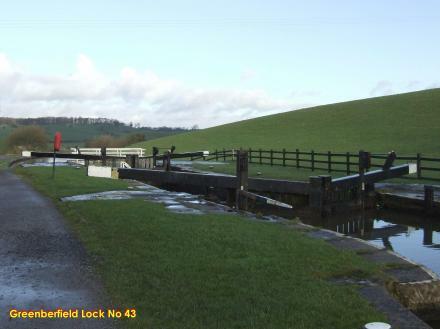 The nearest place in the direction of Salterforth Bridge No 151 is Greenberfield Lock Bridge No 157; ½ furlongs away. The nearest place in the direction of Skipton Junction is Greenberfield Middle Lock Footbridge; a few yards away. This is a lock with a rise of 9′8″. 1455 yards to the east. 288 Fleetwood Road South, Blackpool, FY55EF — 1455 yards to the east. Ravenscroft Way, Barnoldswick, BB18 6JA — 1510 yards to the southwest. Crowsnest Industrial Estate, Rookery Rd, Barnoldswick, BB18 6YH — 1575 yards to the southwest. Greenberfield Lane, Barnoldswick, BB18 5SU — 232 yards to the west. Greenberfield Lane, Barnoldswick — 1579 yards to the southwest. Barnoldswick — 1177 yards to the south. 2 Vicarage Road, Barnoldswick, BB18 6DY — 1534 yards to the southwest. ESSE Engineering Ltd, Ouzledale Foundry, Long Ing, Barnoldswick, BB18 6BJ — 1541 yards to the southwest. Barnoldswick — 1356 yards to the south. unit 1 Ravenscroft way, crownest industrial estate, Barnoldswick, BB18 6JA — 1521 yards to the southwest. Thornton — 1455 yards to the east. 9 East Avenue, Barnoldswick, BB18 6DG — 898 yards to the southwest.